Ht / Wt: 6'6" / 259 lb. 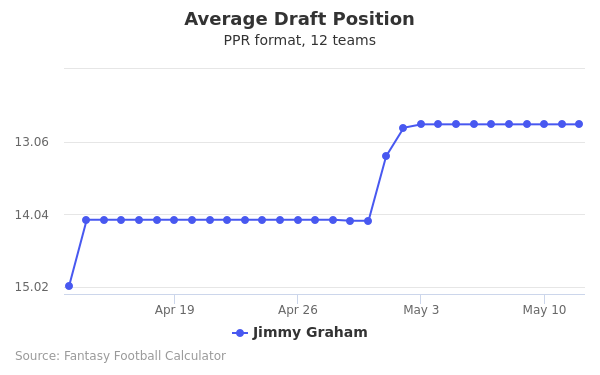 Jimmy Graham's fantasy value is measured by his average draft position (ADP) in fantasy football mock drafts. 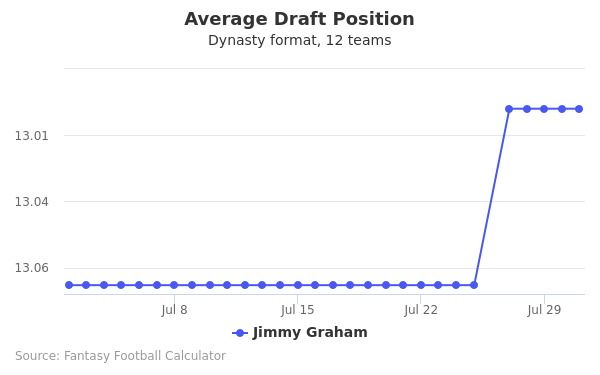 In recent drafts, Graham's current ADP is 13.05, which indicates that his fantasy outlook is to be the 5th pick of the 13th round, and 148th selection overall. The code below will display a graph that updates every day to show the ADP data for Jimmy Graham for the past 30 days in 12-team PPR leagues. Draft Harrison Butker or Jimmy Graham? Draft Jimmy Graham or Kyle Rudolph? Draft Denver Defense or Jimmy Graham? Draft Jimmy Graham or Keke Coutee? Draft Jimmy Graham or Wil Lutz? Draft Jimmy Graham or Zay Jones? Draft Donte Moncrief or Jimmy Graham? Draft Jamaal Williams or Jimmy Graham? 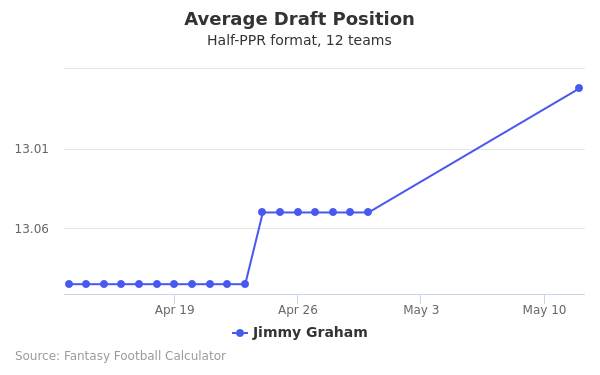 Draft Adam Humphries or Jimmy Graham? Draft Greg Olsen or Jimmy Graham? Draft Austin Hooper or Jimmy Graham? Draft CJ Anderson or Jimmy Graham? Draft Jimmy Graham or Tre'Quan Smith? Draft Jimmy Graham or Malcolm Brown? Draft Austin Seferian-Jenkins or Jimmy Graham? Draft Jimmy Graham or Kalen Ballage? Draft Chris Herndon IV or Jimmy Graham? 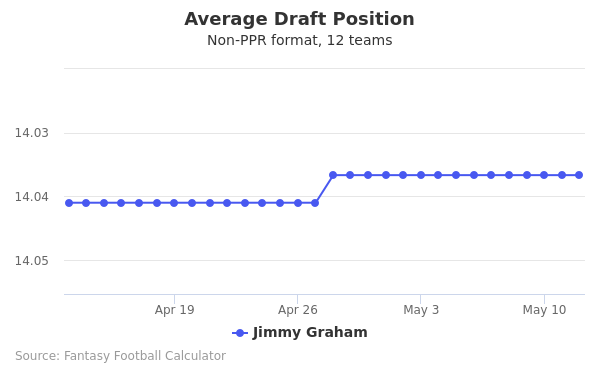 Draft Jimmy Graham or Quincy Enunwa? Draft Jimmy Graham or Ronald Jones II? Draft Darrell Henderson or Jimmy Graham? Draft Giovani Bernard or Jimmy Graham? Draft Jimmy Graham or Ted Ginn Jr? Draft Derek Carr or Jimmy Graham? Draft Jimmy Graham or Marquez Valdes-Scantling? Draft Jimmy Graham or New England Defense? Start Harrison Butker or Jimmy Graham? Start Jimmy Graham or Kyle Rudolph? Start Denver Defense or Jimmy Graham? Start Jimmy Graham or Keke Coutee? Start Jimmy Graham or Wil Lutz? Start Jimmy Graham or Zay Jones? Start Donte Moncrief or Jimmy Graham? Start Jamaal Williams or Jimmy Graham? Start Adam Humphries or Jimmy Graham? Start Greg Olsen or Jimmy Graham? Start Austin Hooper or Jimmy Graham? Start CJ Anderson or Jimmy Graham? Start Jimmy Graham or Tre'Quan Smith? Start Jimmy Graham or Malcolm Brown? Start Austin Seferian-Jenkins or Jimmy Graham? Start Jimmy Graham or Kalen Ballage? Start Chris Herndon IV or Jimmy Graham? Start Jimmy Graham or Quincy Enunwa? Start Jimmy Graham or Ronald Jones II? Start Darrell Henderson or Jimmy Graham? Start Giovani Bernard or Jimmy Graham? Start Jimmy Graham or Ted Ginn Jr? Start Derek Carr or Jimmy Graham? Start Jimmy Graham or Marquez Valdes-Scantling? Start Jimmy Graham or New England Defense? Jimmy Graham was born on November 24, 1986 in Goldsboro, North Carolina. Raised in foster homes since the age of 11, Graham excelled on the prep level as a 6’ 8”, 235 lb power forward, first for Community Christian then Charis Prep, both located in Wilson, NC. While in high school, Graham put up an average of 18 points per game 15 rebounds and 8 blocked shots. Those numbers earned him team and conference most valuable player honors, as well as all-state honors. The highlights of his senior year was an average of 20.7 points a game, pulling down an additional 13.8 rebounds and 4.6 blocked shots. His efforts on the hardwood earned him a Street & Smith Honorable-Mention All-American honor. It was Graham’s prowess on the basketball court that earned him notice by college recruiters. Graham was recruited to play basketball for the University of Miami Hurricanes of the Atlantic Coast Conference (ACC). He played in each of the Hurricanes 34 games as a freshman. He posted a field goal percentage of 53.8% in his sophomore year, which was the second highest for the Hurricane squad. He earned honors as a members of the All-ACC academic team in both his first and second year with the team. By the end of his senior year, Graham had 104 career blocks, ranked eighth all-time in Hurricane history. He helped the team make back-to-back post season tournament appearances, both in the NCAA tournament in 2008 and NIT tournament in 2009. He graduated with a business degree after his senior year, but returned to school to pursue graduate studies and play football at Miami at the TE position. He made 17 catches for 213 yards and 5 TDs in his one and only college football season. Graham entered the 2010 NFL draft and participated in NFL combine where he posted a 40 time of 4.56 seconds. His vertical leap was measured at 38-½ inches and he was deemed by many NFL scouts as raw talent in need of development due to his limited college playing time. Graham was selected with the 95th pick overall in the draft in the third round. He signed for a contract salary in his rookie year of $2.445 million. During the 2015 season, was traded from the New Orleans Saints to the Seattle Seahawks for C Max Unger and Seattle’s first round pick in the 2015 draft. Graham played in 11 of the team’s 16 games that season, making 48 catches for 605 yards receiving and 2 TDs. An injury he suffered to his patellar tendon sidelined him for the rest of the season. Graham returned for the 2016 season with the Seahawks, playing in all 16 of the team’s games. He made 65 catched, amassing 923 yards receiving and 6 TDs. His efforts earned him his first Pro Bowl appearance as a Seahawk. In two playoff games (against Detroit and Atlanta), Graham had 6 receptions for 56 yards and 1 TD. Graham was taken in and eventually adopted while attending high school in Wilson, NC. His mother figure, mentor, and manager, Tamara Fox Meyerson, passed away on May 22, 2015 at the age of 45. Graham, along with Seahawks teammate QB Russell Wilson attended her funeral. Graham’s Twitter handle is @TheJimmyGraham.